The natural resource wood does not only grow without any environmental pollution, growth of woodland even benefits the quality of our environment. Since contrary to the synthetic industrial production of chemical fibres and artificial resins the production of wood does not cause environmental pollution, but leads to benefits for all and the nature which is of great value for us. The forest filters and stores water, it cleans the air, protects the soil and creates a well-balanced climate. Moreover, woodland is a refuge and natural habitat for many kinds of plants and animals. A nature-orientated, sustainable forestry ensures the biodiversity and the environmental capacity of the woods which is so important for our society. Wooden propellers are tolerant against vibrations. Therefore wooden propellers without any limit of life time last longer than metal or carbon propellers, for these only have a limited service life. For four-stroke engines with direct drive mainly wooden propellers are recommended, especially due to the self-generated engine vibrations and possible resonances in connection with a fibre composite construction. For example, virtually all aircrafts of the Red-Bull-Race series fly with tuned and specially adjusted wooden propeller blades, because only this material meets the requirements. The greenhouse effect which will in the long run lead to a global warming of the earth and to disastrous climate changes is for the most part referred to the increase of the CO2 concentration in the earth atmosphere. According to that the worldwide carbon emission is among the most urging problems of environmental protection. During its growth period a tree extracts CO2 from the air, uses the carbon for the building of its own organic substance (see above) and then releases the oxygen. A 25-meter-high beech for example every day releases that amount of O2 which 3 human beings need for breathing. An old tree hardly grows any longer and correspondingly absorbs less CO2. If it is not cut down, it dies back and rots. The bound carbon it then releases as CO2. If the wood is worked up, the carbon remains bound; if it cannot be processed anymore, it can be used energetically - in any case only that amount of CO2 is released which the tree has originally extracted from the air. All these advantages are obvious and help to protect our environment as well as the future of our world. Going back to natural materials and to more environmental protection, like for example the recent developments in the area of electric aviation, is the right way to an environmentally sustainable and highly accepted hobby which is not practised at the expense of our descendants. Avoid plastic toxic waste which cannot really be recycled yet. Save energy, fly at full throttle less often. Buy products manufactured from European materials in Europe. 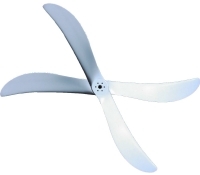 Buy a propeller which has already enough thrust at low rotation speed.